You've found the “U.S. Soay Sheep Breeders” page here at Hobby Farm Wisdom! If this is the first time you have visited our site: Welcome! You are currently viewing the largest directory of small farm animal breeders on the entire internet! We have over 1,000 different breeds of small animal livestock, game fowl, and exotic pets listed here. Use the search bar above to navigate through the site and view the breeder listings of all sorts of different animals. On each page you'll find the complete contact information for each breeder including; website links, phone numbers, and e-mail addresses. Hopefully this will help you find exactly the right breeder as you search for the newest addition to your homestead! Soay is a breed of sheep that was derived from a group of feral sheep on the small island of Soay in the St. Kilda Archipelago. 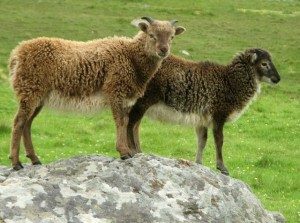 While some Soay sheep were relocated to form exotic flocks, this breed has largely remained feral and helps Soay’s ecosystem with its excellent agility, allowing it to graze in areas domestic sheep cannot. This breed is one of the Northern European short-tail breeds and produces extremely fine wool. Ewes can appear polled, scurred or horned while rams are either scurred or horned. Soay lambs are slower to maturity and produce smaller carcasses compared to commercial breeds. However, the meat is more gamey but lean and tender. Soay sheep are currently listed as “at risk” by the Rare Breeds Survival Trust. We always strongly encourage you to thoroughly check out each animal breeder you are interested in purchasing from before you make your final decision. With over 25,000 different breeders listed on this website, it is impossible for us to be able to vouch for every one! And while we do our best to ensure only the top farmers are listed here, it's always best to double check yourself. Are you a farm animal breeder who isn’t listed? Add your information here. Our Mission: Our mission here at hobbyfarmwisdom.com is to provide the most comprehensive information, directories, and articles about Hobby Farms and their animals. Much like you, we are passionate about the American small farm and want to help anyone who is interested in learning about, or starting their own Hobby Farm. We also highly recommend reading checking out our latest news and informative tips at our blog. Find useful information on everything related to your Hobby Farm or Homestead!!! Saanen Goats – Info, Breeding, and Dairy Goats For Sale! Pygmy Goats For Sale – Info, Locations, and Prices! Nigerian Dwarf Goats For Sale! American LaMancha Goats For Sale! Dwarf Nubian Goats for Sale!